Massive protests against British mining company GCM Resources prevented the company’s CEO visiting the site of its proposed open-pit coal mine in Bangladesh last week. One of the company’s directors resigned the following day. CEO Gary Lye was due to visit Phulbari on 29 January, where GCM wants to open a mine that would displace up to 220,000 people. Mr Lye had planned to distribute blankets to people living in the area, according to the local press. Thousands of people joined protests against the mine, and Lye abandoned his visit on official advice. One of GCM’s directors, Graham Taggart, resigned on Wednesday. The company’s largest shareholder, Polo Resources, has announced that it is considering selling its 29.77 per cent stake in the company. A Bangladeshi parliamentary committee has also spoken out against GCM, claiming that that the company does not have a valid agreement with the Bangladeshi government to proceed with the mine. The British mining company has faced sustained opposition to its planned mine. Three people were killed and around 200 injured when paramilitary officers opened fire on protestors in 2006. The mine in the northwest of Bangladesh is projected to extract 572 million tons of coal over at least 36 years. Eighty per cent of the coal would be exported. As well as displacing up to 220,000 people, it threatens to destroy a major food-producing agricultural region, and pollute of the world’s largest remaining mangrove forest, the Sundarban Reserve Forest, a UNESCO-protected World Heritage site. GCM’s London AGM ended in chaos in December when a protestor dressed as Santa Claus presented chairman Gerard Holden with a Christmas stocking full of coal. The Phulbari mine would devastate hundreds of thousands of lives, destroying valuable agricultural land and causing irreparable environmental damage. 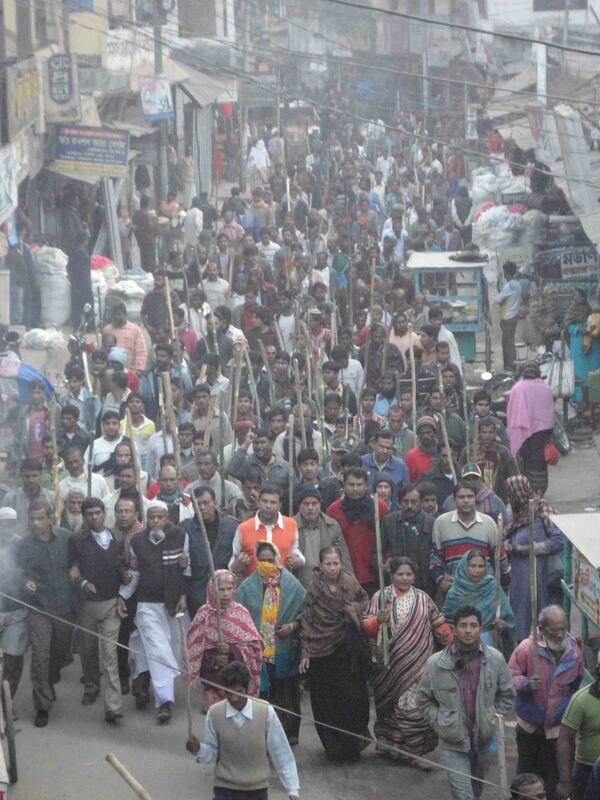 It’s high time GCM listened to the massive sustained opposition in Bangladesh and abandoned the project. Disappearing world … a project for climate refugees near Cox’s Bazar, as people have been forced from islands such as Kutubdia in the Bay of Bengal. Photograph: Salman Saeed. 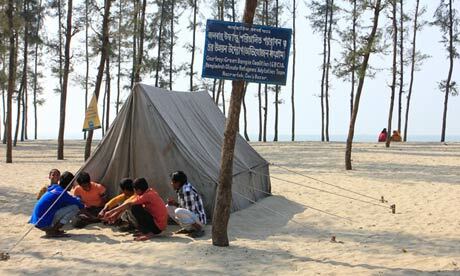 The Guardian Online – Sea change: the Bay of Bengal’s vanishing islands.